Monterey County Gives! is an annual giving campaign that inspires philanthropy and benefits a wide array of nonprofits serving Monterey County residents. It offers donors an opportunity to learn about a range of organizations, and provides a way for both donors and nonprofits to leverage year-end giving for greater impact. In 2017 a record $4.89 million was granted. A partnership between the CFMC, the Monterey County Weekly, and the Monterey Peninsula Foundation, the program benefits from local businesses, foundations and individuals who contribute to an overall matching fund that spurs donations for participating organizations. 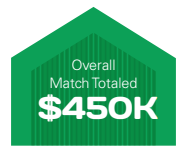 Thanks to Neumeier Poma Investment Counsel, the David and Lucile Packard Foundation, the Cannery Row Company and several CFMC donor advisors, the 2017 overall match totaled $450,000. Participating organizations ask their supporters to donate through the campaign, with each gift, up to $75,000, receiving a percentage match. In 2017, every measure of Monterey County Gives! set a record: total dollars raised, number of donors, number of participating organizations, challenge gifts and overall match funds. 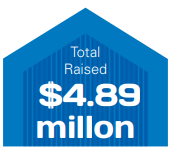 Nearly 5,000 donors contributed amounts large and small to benefit 158 participating organizations. Thousands of residents countywide will benefit from the money raised. The CFMC sponsors three special awards for Monterey County Gives! The Ingenuity Award is a $2,500 grant for the best “Big Idea” in the campaign. The Epicenter won for its program to provide foster and LGBTQ+ youth with leadership and employment experience, putting kids on a path to career and life success. The other two $1,000 awards went to Peace of Mind Dog Rescue for having the most donors overall, and the Monterey Museum of Art for having the most donors between the ages of 18-35. Every year the campaign goes beyond our expectations. 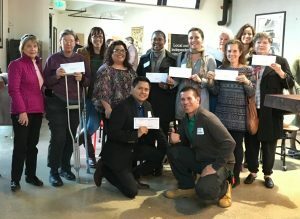 Its success shows how charitable Monterey County can be, while creating opportunity for new donors and generating awareness and resources for participating nonprofits. Monterey County Gives! 2018 includes more than 170 nonprofits and runs November 8 to midnight December 31, 2018. 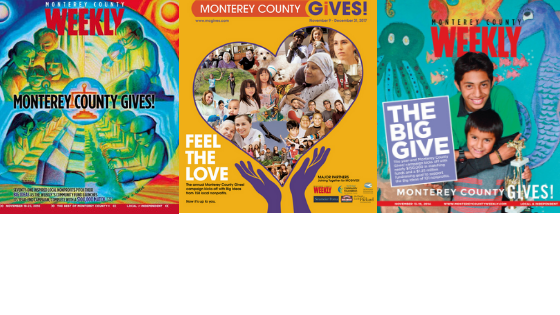 Visit www.MontereyCountyGives.com to participate. Special thanks to our partners the Cannery Row Company, Neumeier Poma Investment Counsel and the David and Lucile Packard Foundation. Monterey County Gives! is a special project of the Monterey County Weekly Community Fund, a special purpose fund of the CFMC.